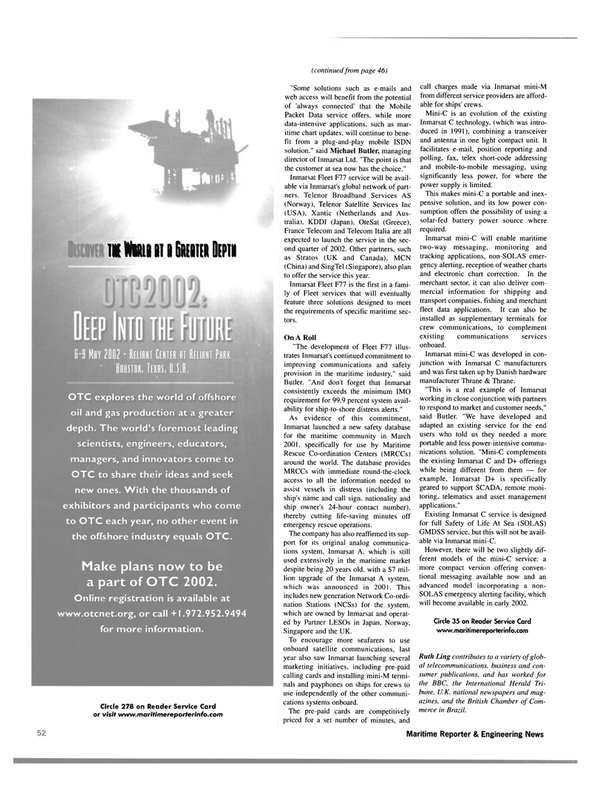 OTC to share their ideas and seek new ones. With the thousands of exhibitors and participants who come to OTC each year, no other event in the offshore industry equals OTC. Make plans now to be a part of OTC 2002. Online registration is available at www.otcnet.org, or call +1.972.952.9494 for more information. Packet Data service offers, while more data-intensive applications, such as mar- itime chart updates, will continue to bene- fit from a plug-and-play mobile ISDN solution." said Michael Butler, managing director of Inmarsat Ltd. "The point is that the customer at sea now has the choice." France Telecom and Telecom Italia are all expected to launch the service in the sec- ond quarter of 2002. Other partners, such as Stratos (UK and Canada), MCN (China) and SingTel (Singapore), also plan to offer the service this year. Inmarsat Fleet F77 is the first in a fami- ly of Fleet services that will eventually feature three solutions designed to meet the requirements of specific maritime sec- tors. Butler. "And don't forget that Inmarsat consistently exceeds the minimum IMO requirement for 99.9 percent system avail- ability for ship-to-shore distress alerts." MRCCs with immediate round-the-clock access to all the information needed to assist vessels in distress (including the ship's name and call sign, nationality and ship owner's 24-hour contact number), thereby cutting life-saving minutes off emergency rescue operations. To encourage more seafarers to use onboard satellite communications, last year also saw Inmarsat launching several marketing initiatives, including pre-paid calling cards and installing mini-M termi- nals and payphones on ships for crews to use independently of the other communi- cations systems onboard. The pre-paid cards are competitively priced for a set number of minutes, and call charges made via Inmarsat mini-M from different service providers are afford- able for ships' crews. Inmarsat C technology, (which was intro- duced in 1991), combining a transceiver and antenna in one light compact unit. It facilitates e-mail, position reporting and polling, fax, telex short-code addressing and mobile-to-mobile messaging, using significantly less power, for where the power supply is limited. This makes mini-C a portable and inex- pensive solution, and its low power con- sumption offers the possibility of using a solar-fed battery power source where required. Inmarsat mini-C will enable maritime two-way messaging, monitoring and tracking applications, non-SOLAS emer- gency alerting, reception of weather charts and electronic chart correction. In the merchant sector, it can also deliver com- mercial information for shipping and transport companies, fishing and merchant fleet data applications. It can also be installed as supplementary terminals for crew communications, to complement existing communications services onboard. Inmarsat mini-C was developed in con- junction with Inmarsat C manufacturers and was first taken up by Danish hardware manufacturer Thrane & Thrane. "This is a real example of Inmarsat working in close conjunction with partners to respond to market and customer needs," said Butler. "We have developed and adapted an existing service for the end users who told us they needed a more portable and less power-intensive commu- nications solution. "Mini-C complements the existing Inmarsat C and D+ offerings while being different from them — for example, Inmarsat D+ is specifically geared to support SCADA, remote moni- toring, telematics and asset management applications." GMDSS service, but this will not be avail- able via Inmarsat mini-C.
SOLAS emergency alerting facility, which will become available in early 2002.